In the wake of 1967’s THE DRITY DOZEN came a plethora of all-star, similarly themed films. 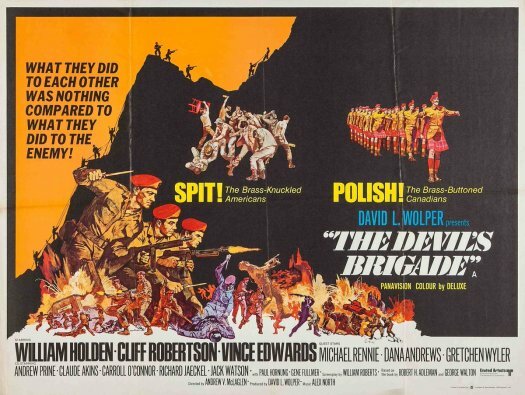 THE DEVIL’S BRIGADE is one of those, though just a bit different: it’s based on the true-life exploits of the First Special Service Force, a collection of American misfits straight from the stockades and the crack, highly disciplined Canadian military, forging them into one cohesive fighting unit. This entry was posted in Film, Film Review and tagged Andrew V. McLaglen, Claude Akins, Cliff Robertson, Cracked Rear Viewer, First Special Service Force, Gary Loggins, Hal Needham, Memorial Day, Richard Jaeckel, The Devil's Brigade, Through the Shattered Lens, United Artists, Vince Edwards, war movie, William Holden. Bookmark the permalink.